Earn i-piggy points from Independent Retailers and other businesses in towns when you pay at the till or on-line. 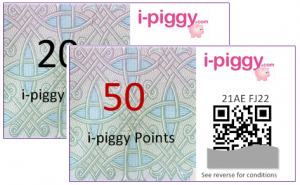 All our partners belong to i-piggy’s UK-wide programme so you earn points anywhere the logo is displayed. i-piggy gives you great reasons to go shopping in town. Shops and businesses using i-piggy (Partners) can post their very latest News, Offers & Deals (NODs) which you can view and search for on your i-piggy App when you’re out and about – or the i-piggy website if you are at home or don’t use a smartphone – and there may even be a display screen in town if you don’t use either. So, if a local florist is offering 50% off cut flowers after 4pm on a Saturday afternoon or a fashion shop has new stock in or a local restaurant is offering 2 meals for £12 on a Monday - you’ll see it first on i-piggy. 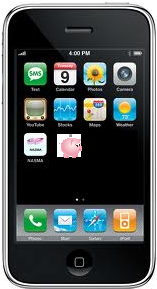 And, if you visiting another town using i-piggy you can switch settings to view offers in that town. Points can also be earned as incentives – extra reward points for you in return for completing or participating in an activity or programme. You can also get ‘points-back’ on certain product promotions and inside i-piggy’s own greetings cards and other gifts. i-piggy keeps you updated with the latest opportunities to earn extra points as they arise. To check, collect your points, view your earnings, see latest offers and find local i-piggy partners, you can login to your i-piggy web page BUT we recommend, if you have a smartphone, downloading the i-piggy member App, which puts all these features at your finger tips while you are out and about. It’s easy to donate your points to other members – such as to your children and charities – they can receive points as gifts from any number of donors (e.g. grandparents, supporters and sponsors). You can donate your points automatically or manually and divide them up to give to multiple members. If you run a charity or ‘good cause’, opening an i-piggy account will provide you with a simple way to gather extra revenue from i-piggy members. By setting up automatic donations, you can trickle your incoming points to your children’s accounts – a painless way to build their long-term savings. And, note that i-piggy gives bonus points to junior members to boost their savings. But, If you want to, you can keep or use your points yourself for saving, spending or both.